The JTAG ProVision software suite is used to generate boundary-scan tests and in-system programming applications for assembled PCBs and systems. This professional development tool is fully automated and supports the import of design data from over 30 different EDA and CAD/CAM systems. 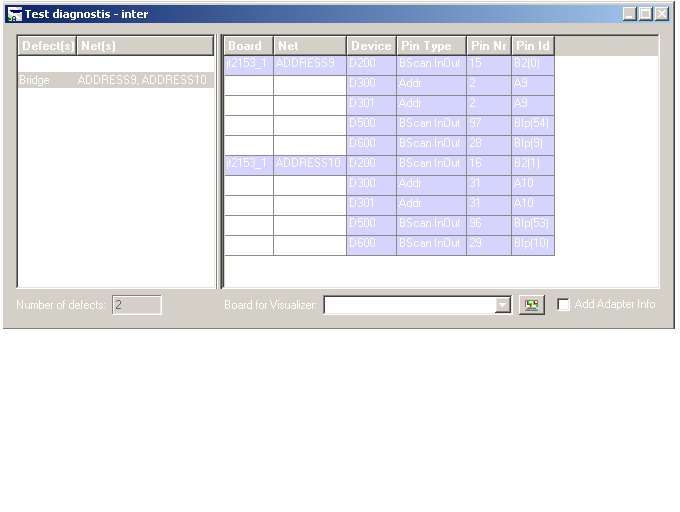 Other key data inputs are JTAG device BSDL (description) models and a large, well-maintained model library describing thousands of non-JTAG devices which includes memories, bus logic, and other active and passive parts. With ProVision you can rapidly generate a wide range of test and programming applications using a project database built up from the inputs above. All applications can be optimized, validated and run within the ProVision environment prior to delivery of the finished test sequences to the manufacturing and/or testing facility. ProVision’s development features are tightly integrated with JTAG Technologies’ advanced test coverage analysis tool and with JTAG Visualizer graphical display system for design schematics and layouts. You can use these tools to rapidly assess the thoroughness of the test during development and to make improvements prior to release. 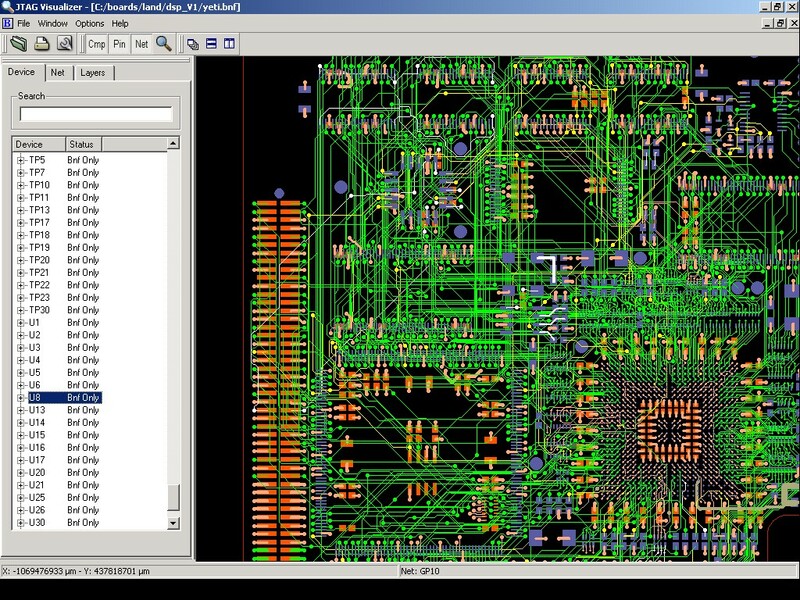 JTAG Visualizer is an advanced graphical viewer and data management system for PCB schematics and layouts. Visualizer integrates seamlessly with the JTAG Technologies family of boundary-scan products, such as the ProVision application development platform, and accepts PCB data from a variety of CAD, CAM and EDA tools. In design, Visualizer provides DfT (design for test) feedback to the user by enabling a graphical view of fault coverage on their design. In manufacture and test, Visualizer can be used to highlight faulty nets (short circuits, opens, stuck-ats etc.) in both layout and schematics views. Visualizer also supports cross-probing between schematics and layout as well as a layout underside ‘flip’ view mode. Using PSA, test engineers can build sequences of applications in the built-in AEX (Application EXecutive) manager using if, then, else, and goto capabilities. 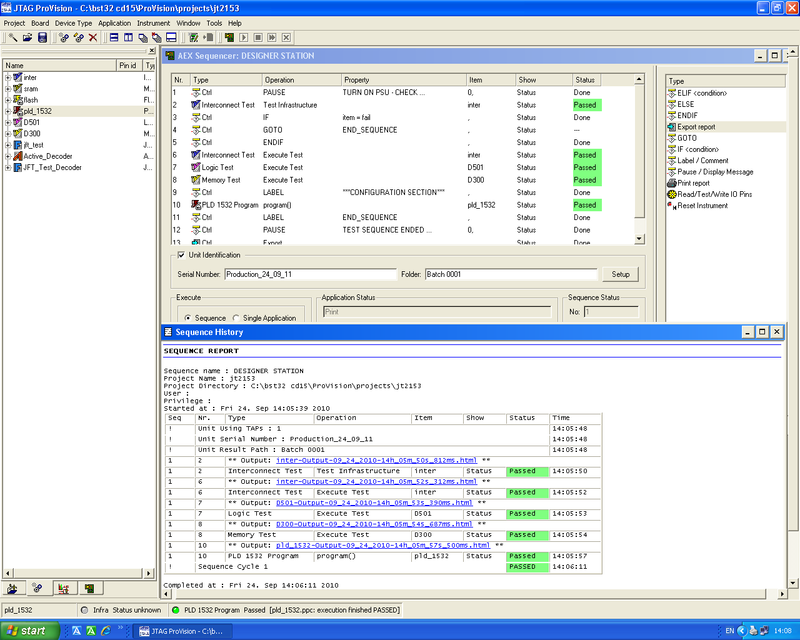 Sequence builders can also include additional capabilities through DOS/Win command line calls, create serial number logged test reports, export tests results to a database etc.. PSA includes drivers for all JTAG Technologies controller hardware past and present. While a full ProVision system allows development and execution of JTAG/boundary-scan test and programming applications, it is possible to use the same familiar user interface in a reduced functionality version within production. ‘ProVision Platform’ is available for test execution only, flash in-system programming (ISP) only, PLD ISP only, or of course any combination of these. Each ProVision Platform licence includes the capability to import ProVision development archives, execute applications and review test results in the familiar TTR (Truth Table Report) format and, optionally BSD (diagnotics) or Visualizer (graphical viewer). The system also includes our acclaimed AEX (Application EXecutive) manager for application sequencing which itself includes if, then, else and goto structures for building more complex test and programming sequences as well as report generation and results storage by serial number. 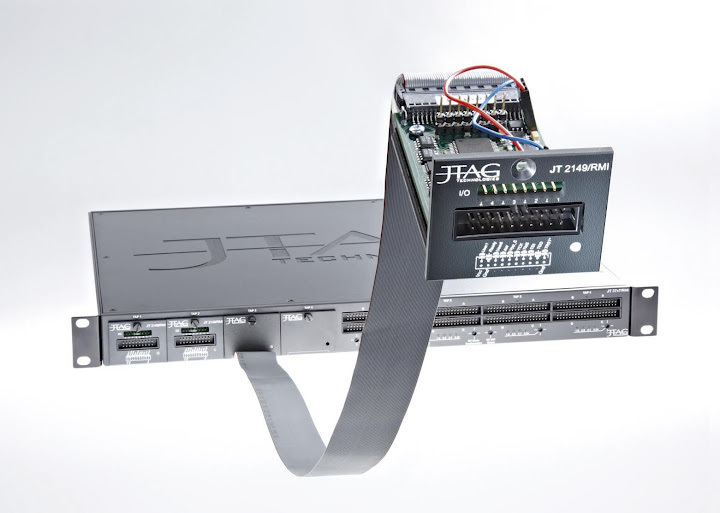 JTAG Technologies Production Integration Packages allow users to execute the full range of JTAG board test and programming applications from a ‘third party’ environment. In addition to the test oriented front-ends such as National Instruments’ LabView and TestStand, JTAG Technologies also provides support for a range of generic compilers for Microsoft and others. For C/C++ there is PIP/DLL, for .NET framework systems such as Visual C, Visual Basic etc. we offer PIP/.NET and for older Visual Basic compilers there’s also PIP/VB. There’s even a DOS/Win command line execution package called PIP/EXE. Each PIP package includes full capability to load and launch applications to test and program boards on our DataBlaster, Explorer or new MIOS (mixed-signal) IEEE Std. 1149.x boundary-scan controllers. As a long-standing alliance partner with National Instruments, JTAG Technologies is able to offer a wide range of high-level integration options for the National Instruments’ control and test executive packages – TestStand, LabView and LabWindows/CVi. As part of our PIP (Production Integration Packages) family our National Instruments support options have enabled our customers to seamlessly and reliably integrate high-quality boundary-scan applications into their test and device programming systems for almost 20 years. 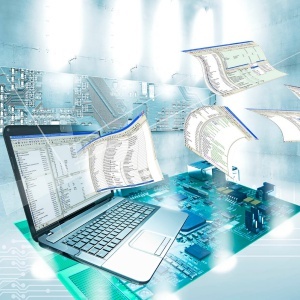 BSD Test Diagnostics software can be added to either developer or factory run-time systems to further improve the location of faults such as net bridges (short-circuits), open pins, open nets and even ‘twisted’ connections that can occur within cable assemblies. BSD Test diagnostics reports faults in a verbose English language statement with pin level information included and can easily interpret multiple fault conditions. Additional capability can be added to the test diagnostics package through the use of fault dictionaries that can be created for functional logic (cluster tests). These can help pin-point faults that may occur deep within a functional logic block. 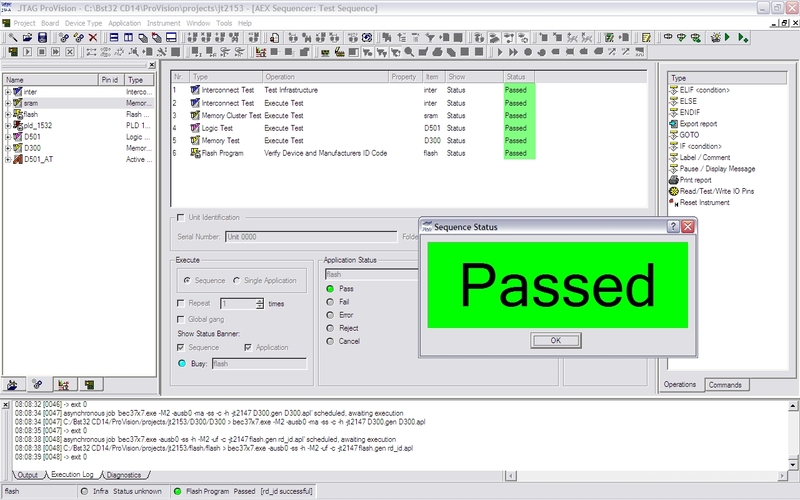 Test diagostics is the ideal complement to the TTR (Truth table reporter system) that is included in our ProVision developer suite and also PIPs (Production Integration Packages). BSD Test Diagnostics is a standard feature of the Symphony family of run-time systems that have been developed to allow JTAG Technologies applications to be executed on third party ATE systems. A JTAG controller connecting your PC or workstation with the JTAG interface on the board. I/O modules for boundary-scan access to I/O connectors and special test points on the board. 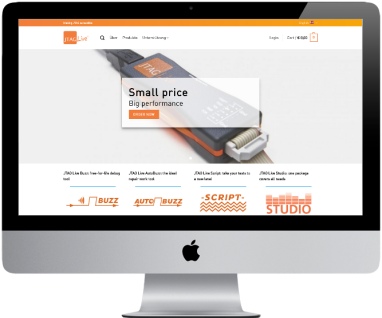 To reliably execute your test and programming applications you can choose from a range of different controllers with different performance capabilities and form factor. The high speed JT 37×7 DataBlaster is the top model. It has a scalable performance and is available in a large variety of different form factors. The JT 5705 mixed signal controller supports control and measurement of analog signals in combination with boundary-scan. The JT 5705 Explorer controller with a USB interface is the ideal choice when a maximum performance is not the main driving factor. Choose auxiliary I/O modules to add scan test and analog measurement coverage into portions of your design that lack boundary-scan access. Select digital I/O scan (DIOS) modules, mixed I/O scan (MIOS) modules, or Socket Test Modules (STM) to conveniently test sockets, connectors and sensors. You can have your boundary-scan controllers and I/O modules as separate instruments, or you may combine them in a single instrument. The Rack- Mountable Instrument (RMIc) for example is a self-contained unit with one or more boundary-scan controllers and I/O modules of your choice, perfect for installation in a 19-inch test rack or in a benchtop set-up. The JT 5705 effectively combines a 2 TAP controller and mixed-signal IO (MIOS) channels, making it virtually a self-contained ATE. The high-speed DataBlaster controllers are available in all of the popular formats (PCI, PCIe, PXI, PXIe, USB, Ethernet, Firewire) for stand-alone use as well as for seamless integration with your Functional Test System. For a seamless integration with your In-Circuit Tester or Flying Probe Tester dedicated form factors matching directly with the format of your tester are also available. If you combine your JTAG controller with your In-Circuit Tester, Flying Probe Tester, or your Functional Test System you can use the test and measurement hardware of that system instead of auxiliary I/O modules to measure the I/O connectors and test points in combination with boundary-scan. We’ve even got a product for remote operation over any distance, JTAG TapCommunicator. TapCommunicator is a truly unique product that can overcome problems caused by lack of target accessibility. By harnessing the native communications protocol of the target (e.g. E-net, Bluetooth, SpaceWire etc.) 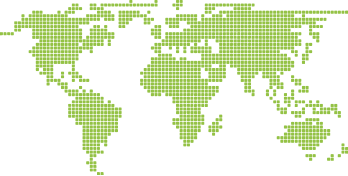 boundary-scan tests and programming applications can be applied over virtually any distance.